Say you’re just coming down from a medically-prescribed high that caused you to hallucinate you were having a grand adventure in a fantasy realm for three days straight. Blearily surfacing from the half remembered murk of poor motor control and the hellish cacophony of a thousand thousand voices constantly screaming for food, you awaken to discover a small briefcase sitting on your front doorstep. Inside the briefcase is thirty-five thousand dollars in cash and a small note stipulating that it may only be used to take over the war-torn third-world country of your choice. Your previous military experience is zero, so you’re probably going to need some help with this. Where do you start? Why, the internet of course! You can find anything on the internet. Florists. Insurance companies. 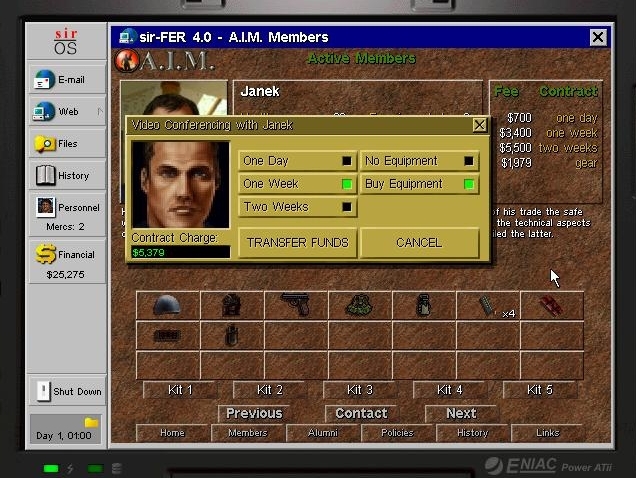 International mercenary organisations with one-click hiring and free helicopter delivery. Let’s look at what’s available. Aha, a rogue’s gallery if ever there was one. 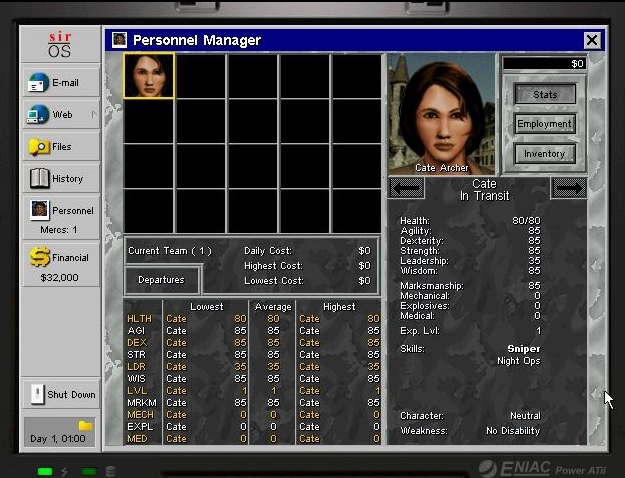 Cate hires the five cheapest, most expendable mercenaries she can find, although even this budget option stretches her finances to breaking point. 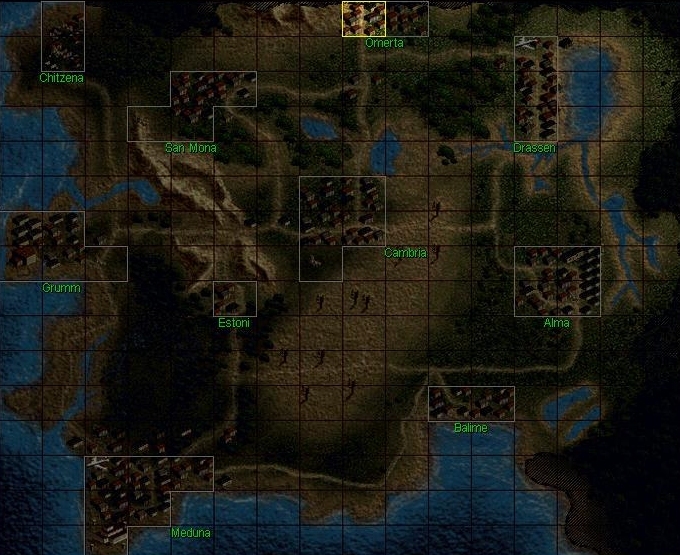 Operating under her able leadership, these five men will leave a bloody trail of death and destruction across northern Arulco until such time as Cate manages to secure a stable means of ongoing funding and hires some mercenaries that are actually good. Let’s meet the Z-Team. 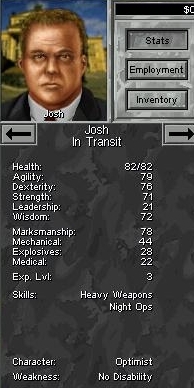 Josh, night operations and heavy weapons specialist. 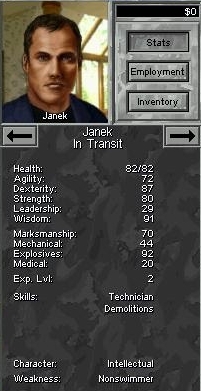 Janek, the go-to man for bombs and explosives. 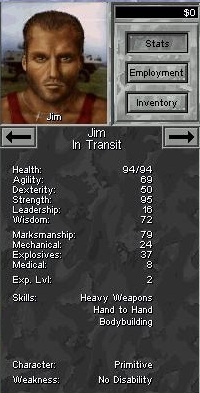 Jim, a burly, brawny slab of meat with a stabby stabby knife. 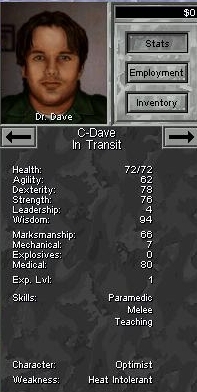 And finally C-Dave, team doctor and terrible marksman. The team is inserted by helicopter in the bombed-out ruin of Omerta, Arulco’s northernmost city and what used to be the rebel stronghold. 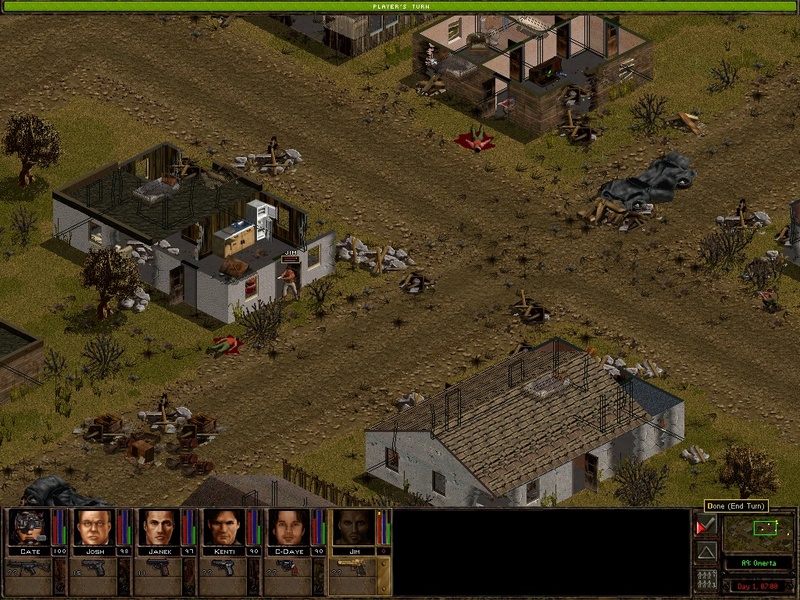 Cate is slightly annoyed to discover that she was the only one who thought conquering a country would require slightly more than a pistol and a couple of dozen bullets, but despite being the only merc on the ground with an actual weapon she hangs back to see how the team does in their first combat encounter. Which touches off roughly two seconds after the team hits the ground. 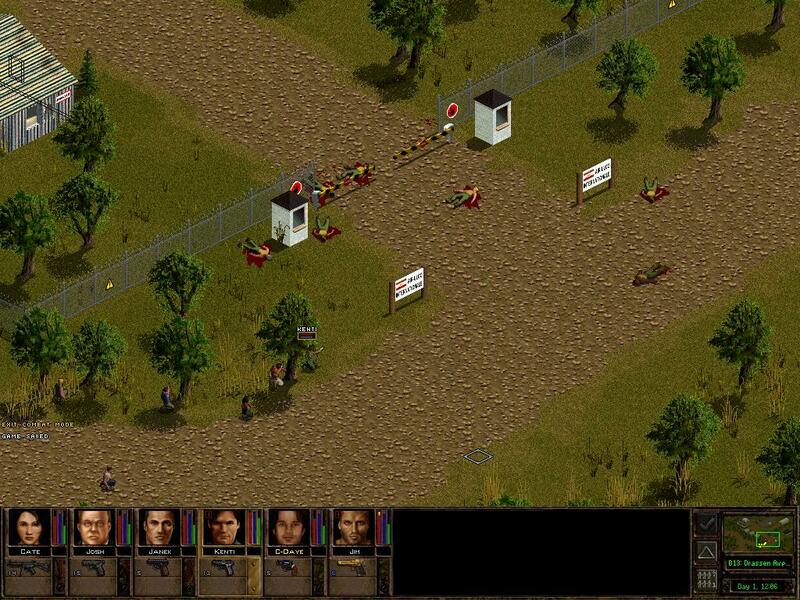 C-Dave manages to nail the first enemy soldier with his crappy .38 Special. This will likely be the only kill he manages to get for a long, long time. 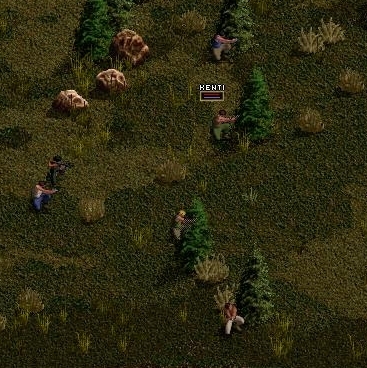 Jim uses his oversized Desert Eagle to fill a second enemy full of holes while Josh and Kenti flank around to the right to flush out any enemy hiding there. 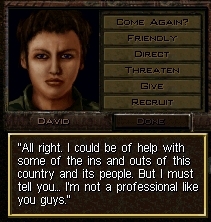 They don’t find any, but Kenti is called upon to save Jim’s hide when a third soldier pops up in front of him and hoses him with SMG fire, winding him despite his Kevlar vest. Kenti responds with three ambitious pistol shots from extreme range (to the point where the bullets are actually starting to drop by the time they reach their target), the third of which amazingly manages to hit Jim’s assailant in the head, spinning him round and knocking him senseless. 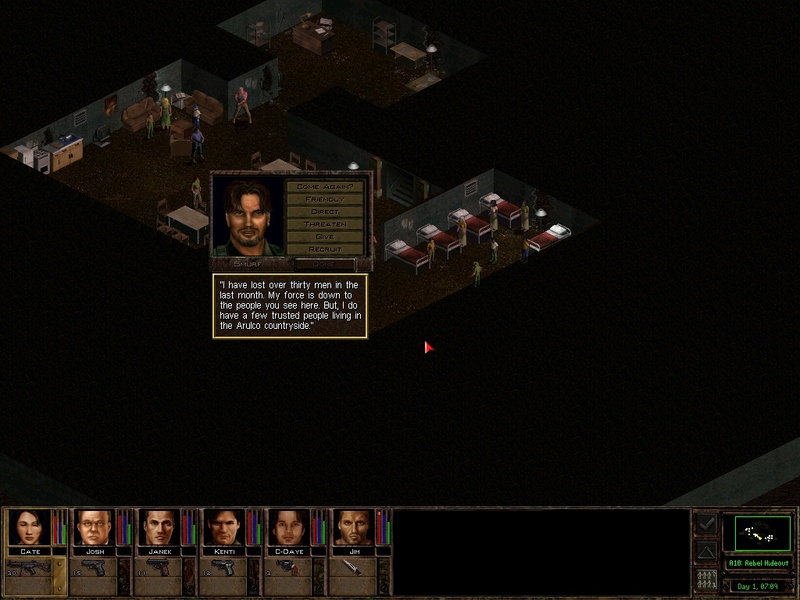 Jim is quick to capitalise and finish him off, and then rounds a corner to encounter a final enemy who has unwisely ventured within stabbing range. The dust settles to reveal a disgusting urchin standing in the middle of the road. 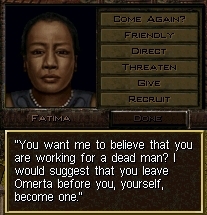 A blood-drenched Jim moves to question him but for some reason this unsettles the sprog to the point where he takes off running back to his mother. Who insults the team to start with, but agrees to take them to the rebel headquarters after Cate slips her a couple of twenties. Said rebellion turns out to consist of about a dozen guys in a basement. But wait, who’s that leading this little insurrection? Well well. Smurf promptly pawns off the least-wanted member of his little band on Cate — who will be useful as an ammunition carrier if nothing else – but regrets that he can offer no more assistance until he gets “food” and “medicine” for his people. This is to be found in Drassen, a city to the east which also has one of Arulco’s two functioning airports and one of its five gold mines. 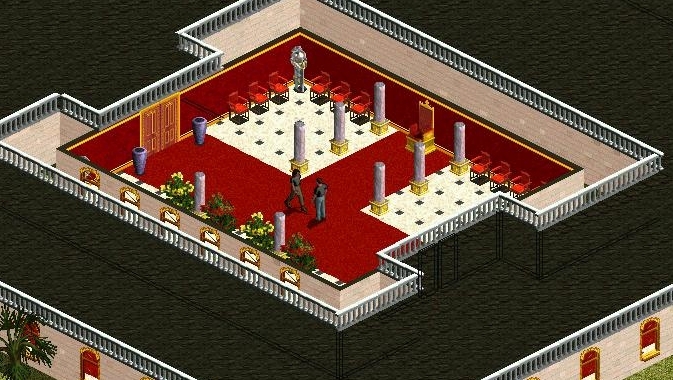 Sounds like the perfect place for a base of operations. 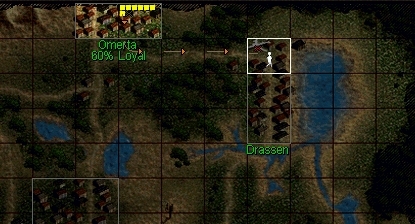 To Drassen! The team sets out with David trailing along at a respectful distance, but they run into trouble on the road in the form of six yellow-shirted soldiers. The dictatorship currently running Arulco must have spent all their money on colourful uniforms because they clearly didn’t invest any money in, for example, weapons for their soldiers more sophisticated than World War II vintage armament. Overcoming the patrol is therefore a trivial business which allows me to showcase my stock strategy of “Hiding behind the heaviest thing you can find while firing as many bullets at the enemy as possible.” That should change later, but while we’re stuck with pistols and SMGs ourselves that’s what I have to do to compensate for their woeful accuracy and range. The guards at Drassen airport fare little better. 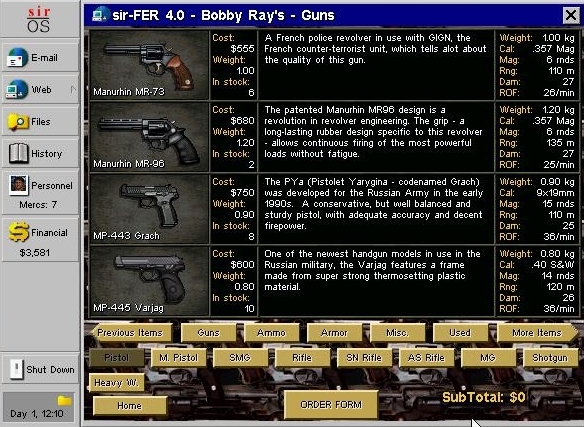 Kenti is proving to be a rather good marksman, scoring several improbable medium-range hits with his crappy Soviet army surplus sidearm. The naughty step is reserved for Jim, who loaded his gun with anti-personnel hollowpoint rounds (see the blue number under the weapon) in anticipation of the lightly-armoured yellowshirts (Arulco’s equivalent of reserve forces) but who only managed to score a single kill despite firing fifteen shots. With the airport firmly under mercenary control, we can now fly in some heavier armament. Or at least we could a) if the online store were selling anything heavier than a Magnum right now and b) if buying said Magnum wouldn’t wipe out a full half of the group’s remaining cash. The next step is getting some more money, but that’ll have to wait. After a busy day of slaughtering poorly armed & trained army conscripts, the mercenaries settle down for some well-earned rest. That night, Cate has a strange dream about the evil Queen currently holding Arulco in her iron grip. And you were there, and you, and you…. This is going to be good. I heartily approve of the renames, do you have to hack files about a bit to do that? I don’t recall being able to do that the last time I played. 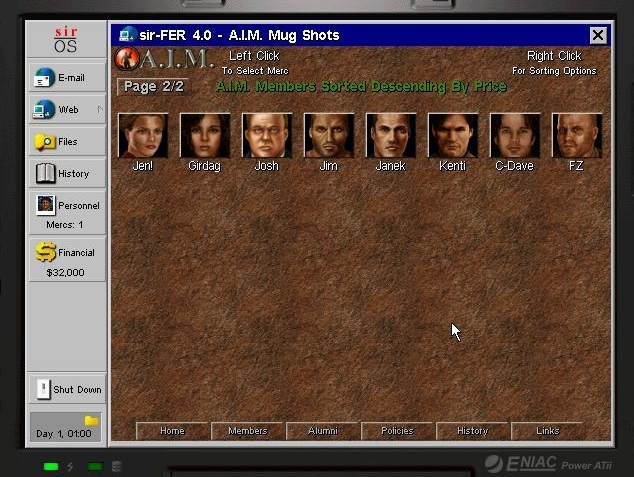 The 1.13 patch came with a helpful mercenary editor that makes it very easy to do if you can remember who is who. Kenti kill many Germans in war with sniper rifle. Also with bare hands. Also with bear hands.